Palma is the capital and largest city of the Balearic Islands in Spain. Palma was founded as a Roman camp upon the remains of a Talaiotic settlement. The city was subjected to several Vandal raids during the fall of the Western Roman Empire, then reconquered finally by James I of Aragon. Palma is a large, bustling city, located directly at the sea, becoming an increasingly popular destination. Among other Spanish cities, it is perfectly intertwined culture, history, gastronomy, shops, hotels and nightlife. Lovers of relaxation by the sea will find here a very long avenue for boating, jogging or skating with stunning views toward marina with super yachts. Illetas is a small resort with a 4/5 star hotel, and is often compared with Monte Carlo. Genova is located a little further away Palma, Majorca ischitaetsya center restaurants. It is home to a fairly large number of Englishmen. Andratx is a municipality on Majorca located in the southwest of the island. The town of Andratx is ancient and until recently was mainly inhabited by local Majorcan people. Andratx is especially popular amongst celebrities from Germany, UK, USA etc. The reason why many of them decided for this location with astonishing luxury properties and lovely promenade is mainly a little aside and hidden position. Puerto Andratx has some hidden locations, such as bays Cala Llamp, Cala Marmassen or Cala Moragues, as well as the hill Montport. Camp de Mar is a small beach resort, in certain way separated from other tourist resorts, offering a platform for the game of golf and an impressive diversity of beautiful villas and a few 4/5 star hotels. One of the most exclusive residential areas in the south of Mallorca with beautiful villas in the Costa den Blanes hillside, with views of the prestigious marina (Puerto Portals) and the bay of Palma. It is home to many very wealthy people, tasting of some of the best bars and restaurants in the whole island. Beverly Hills on Majorca! With Costa den Blanes overlooking the Portalz Nous, an exclusive marina and the bay shining behind him. In addition, there is a must see for tourists, "Marineland" with a dolphin show. Bendinat - this is a very prestigious residential area on the coast between San Agustin and Portalz Nous, uniting both old and new houses, and later arranged around a first-class international golf club. Cas Catala is a residential area, 5 km south-east from Palma, between San Augustin and Bendinat. There is a small beach called La Bugambilla, popular mainly among the locals, and more complete during the weekend. One of the first beach resorts with large residential areas, mainly for high-end market, popular among foreign owners of primary and secondary homes. Everybody can find something for themselves: 2 beaches, 2 marinas (including the Port Adriano), 3 golf courses, restaurants, bars and clubs, boat trips and more. El Toro-known, reputable residential area, outside the Santa Ponza, famous for its modern yacht port (Port Adriano), a beautiful beach and a few local shops, bars and restaurants. Costa de la Calma - inspires confidence in the peaceful residential area with numerous villas, pine hilly landscape at the same time is close to a bustling resort of Santa Ponsa. 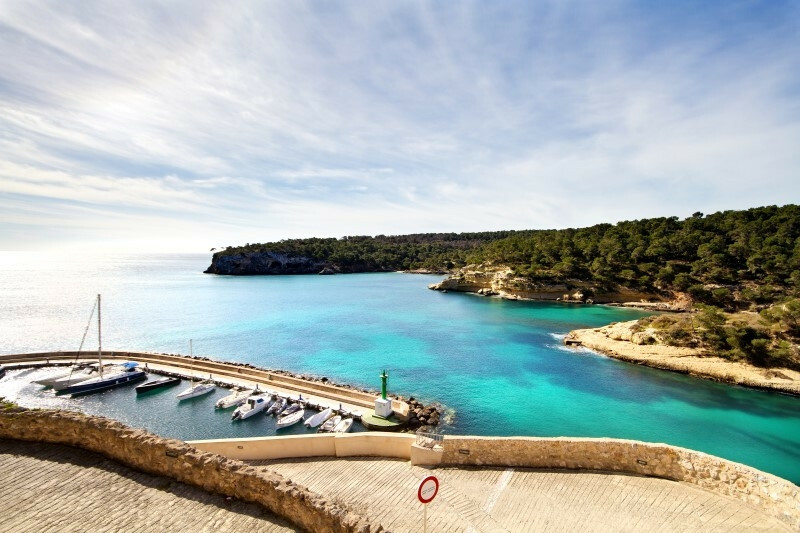 Sol de Mallorca area is located in the southwestern part of Mallorca between Cala Vinyas and the Portal Wels. Located high up on the cliffs, surrounded by wooded hills and the sea, the area like no other allows you to enjoy complete peace and quiet and privacy. Cala Viñas is a small resort town located next to a pine forest, residential area. Quiet and peaceful place, at the same time near to far exceed its size, Magaluf and 4mya local facilities for golf.